Blackmores Odourless Fish Oil Mini Caps provide the same strength of omega-3 as a standard fish oil 1000mg but in a half sized capsule. Fish oil is a natural source of marine omega-3 fatty acids. It helps to support heart and cardiovascular health and assist in the maintenance of normal eye and brain function. This is an ideal dietary supplement to take if you can't manage to eat the recommended 2-3 serves of fish a week. 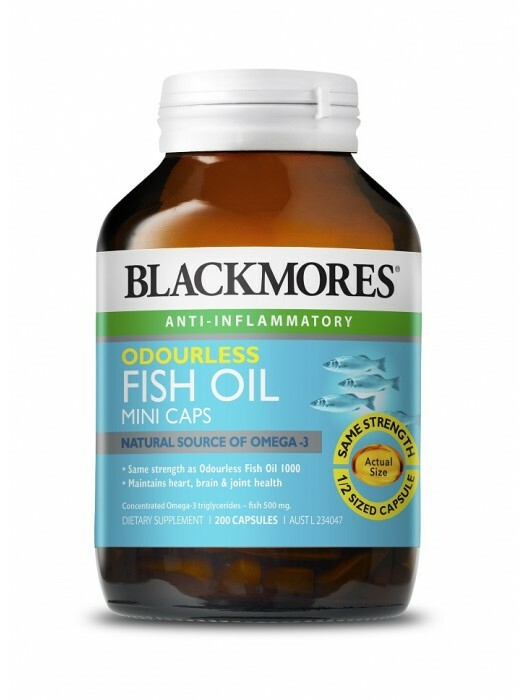 To ensure you can take Blackmores Fish Oil Mini Caps with confidence, Blackmores regularly tests its fish oil for mercury and only uses high quality fish oil without added artificial surfactants to disguise fishy odours. Fish oils appear to alleviate the symptoms of rheumatoid arthritis due to the role of omega-3 fatty acids in suppression of the production of inflammatory compounds.